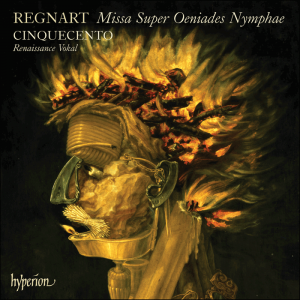 Cinquecento’s first disc for Hyperion (Music for the Court of Maximilian II CDA67579) was acclaimed as ‘a revelatory disc’ and ‘an outstanding debut recording’. Their supple, mellifluous, expressive singing was particularly praised: ‘Their voices are young, lithe, pure in intonation and warm in timbre—in short, ideal for interpreting Renaissance polyphony’ (International Record Review). Their eagerly awaited second release presents the music of Jacob Regnart (c1540–1599) and continues their exploration of the rich repertoire which was engendered in the Hapsburg court. The centrepiece of this disc is the splendid Missa Super Oeniades Nymphae, an expansive and elaborate setting for six voices. Also included are two state motets and six sacred pieces, which demonstrate the extraordinary musical and emotional range of Regnart’s work.